If you can dare to be different, you'll find the MA-2T a willing accomplice that speaks to reprobates and sophisticates alike. Bespoke feel. High quality build, finish and spec. From across the room, the Manson MA- 2T looks like a descendant of the Fender Telecaster. But get up close and you'll see the MA-2T is nothing of the sort: it's a radical new-breed electric, trick-or-treating in period costume. Of course, any guitar bearing Hugh Manson's name is an iconoclastic challenge to the established order. 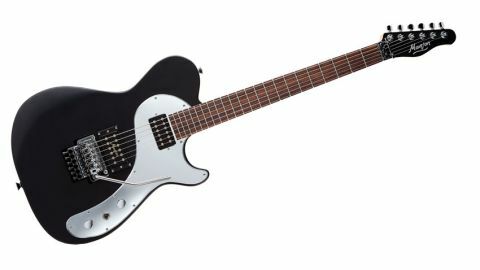 Manson Guitars has never been shy - the British firm is most famous for building Matt Bellamy's super-spec'd MB-1 signature model. Its stable is front-to-back maverick, with every traditional trope of guitar design countered by a modernist flourish. "Manufactured in the Czech Republic, assembled in the UK - the result is a guitar that maintains Manson's custom shop cred, without the eye-watering price tag"
Unlike its one-off custom models, Manson's M series guitars are manufactured in the Czech Republic before being assembled, wired and set up in the UK. The result is a guitar that maintains Manson's near-mythic custom shop cred, but without the eye-watering price tag to match. The MA-2T's body is very much a hybrid, the lower horn more Les Paul than Tele. It's harking back to the electric guitar's origin story, but then there's the Floyd Rose Original locking vibrato unit. The MA-2T might have a sober aesthetic, but it's rigged for speed, rigged to rock - to shred, even. Sure, shred is not a polite phrase to use around grown-ups, but this is a quasi-shred guitar with impeccable table manners. The MA-2T's neck has more to it than an off-the-shelf Jackson or Ibanez, but its soft V will accommodate the most ardent speedster and classicist alike. It has a Fender-ish 648mm (25.5-inch) scale, but a heft to it that makes it equally reminiscent of a Les Paul. "A pair of Manson 'buckers, custom-wound by Bare Knuckle Pickups make the MA-2T truly sing"
A pair of Manson 'buckers, custom-wound by Bare Knuckle Pickups, have all the oomph needed to complement the solid alder body (which is contoured to be more ergonomically forgiving than a Tele), and make the MA-2T truly sing, with a wide-ranging voice that's somewhere between a Les Paul's thickness and a Tele's sharp, biting character - but it's an accent unrecognisable from its forebears of electric guitar design. The MA-2T has plenty of character in its clean tones, and a real mean side when the gain is dialled in. There's no such thing as a guitar to please all players - the floating vibrato will put off many, so too, to a lesser extent, will the minimalist fret markings. But in terms of sheer functionality and sound, the MA-2T is awesome. It's not cheap, but then it is a serious guitar with a bespoke feel, and you get a lot for your money (including a gigbag). Manson believes in the guitar as a personal statement.